With 3D printer making a prototype or spare part out of metal or polymer, researchers at Princeton University have taken a step in expanding the technology’s capabilities by creating a way in print functioning electronic circuitry out of semiconductors as well as other materials. They are also trying ways of combining electronics with biocompatible materials and even living tissues that can pave the way for new implants. According to Michael McAlpine, assistant professor at Princeton states that with cartridges that are full of semiconductor `inks’, it can be possible to print circuits of all types of tasks and to demonstrate it, the researcher printed a light emitting diode within a contact lens. The display circuitry and processors in computers do not have the provision to 3-D printing since they need several complex components fabricated on the nanoscale though it could be utilised in making medical devices or implants incorporating electronics. McAlpine had used 3-D printing last year, to make a `bio-electronic’ ear which was made from living cells together with supportive matrix of gooey hydrogel and had conductive ink which was made from a suspension of silver nanoparticles that formed an electrical coil and could receive radio signals. Thereafter his group worked to expand 3-D printing to semiconducting materials which enables a printed device to process incoming sounds. Semiconductors seem to be the key ingredient of information processing circuits which can be used to detect as well as emit light. McAlphine’s team, to broaden the 3-D printing palette, built its own printer and several of them in the market presently, are only designed to print plastic The bionic ear, for example had features on the millimetre scale. In order to make LEDs they had to go to the micrometre sale. Quantum dots were taken to make the LED by the Princeton researcher, semiconducting nanoparticles which emitted bright light in response to electrical current. Besides this, two types of metal were also used to make electrical leads and contacts for the device together with polymers and silicone matrix in order to hold it together. While printing with so many inks, the challenge was that they bled into each other and hence the researchers had to ensure to suspend each material in a solvent which would not mix with either of them. His team had made a cube of eight green and orange LEDs which were stacked 2 x 2 x 2 and printed the LEDs on contact lens after they were scanned in order to make the shape of the printed devices matching to the curvature of the lens surface. McAlpines’ team are not the only ones working in expanding the possibilities of 3-D printing. 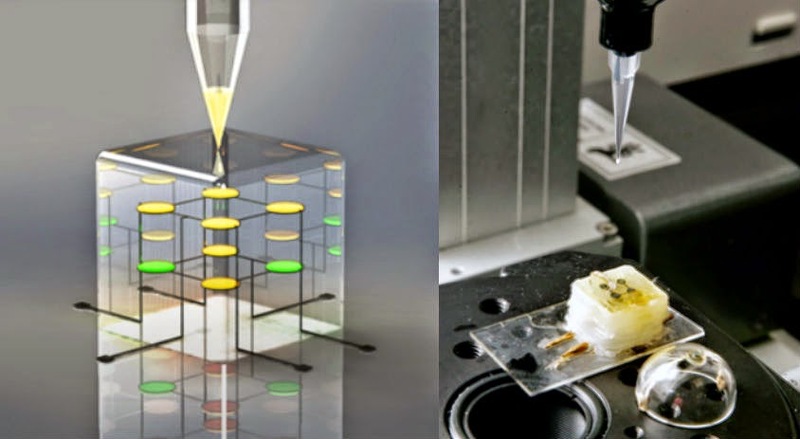 Chemical engineer, Michael Dickey from North Carolina State University in Raleigh who was not involved with McAlpines’ work, states that `most 3-D printing is like a glorified hot glue gun just printing polymers. His group developed a liquid metal which can be printed into stretchable, self-healing wires while a professor of biologically inspired engineering at Harvard, Jennifer Lewis has developed 3-D printing for tissue engineering on combining various cell types in complex patterns including blood vessels.